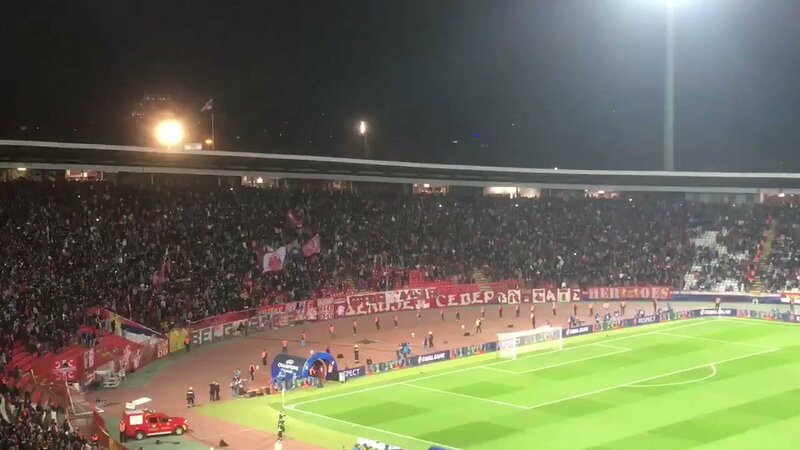 A trip to Red Star Belgrade was always going to be a daunting one for the Liverpool squad but even they might have been surprised by the welcome they got prior to kick-off this evening. A Champions League game that they really need to win, Liverpool do go into the match as the red hot favourites for the three points but it won't be easy given the hostile atmosphere at the ground. Packed to the rafters way before kick-off, the home fans came together for a choreographed rendition of "F**K You Liverpool!" and it echoed around the stadium in stunning fashion. The video of the insult quickly spread on social media as you would expect and gave the fans at home some idea of one of the hottest atmospheres in world football. Liverpool breezed past Red Star Belgrade at Anfield 4-0 last time out but the Serbians are no mugs at the Stadion Rajko Mitić, with no defeat on their own patch for over a year, with the added atmosphere clearly making it a tough place to visit. Jurgen Klopp was slightly frustrated with the performance against Arsenal at the weekend and this game will be the perfect opportunity to bounce back with three points which will put last season's finalists on the verge of qualification for the last 16. Napoli and PSG play each other this evening which makes this group even more interesting but there is no doubt that the fans in Belgrade are going to make the game as tough as possible for their English visitors.